A tin of quick setting, expanding foam is one of those really handy items to have around when you need to fill an awkward gap. Straight out of the can, expanding foam looks like a thick cream. Within a few seconds it expands, then gradually sets to form a lightweight, tough filling material. 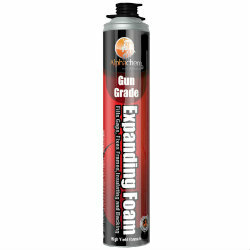 This is a product with hundreds of DIY uses – it’s the quick, easy way to seal gaps around waste pipes and window frames. Once set, the foam can be sawn, cut with a craft knife, sanded and overpainted. This is a popular item that we sell at a really low price. You’ll find that the foam doubles in size after spraying; making these low cost 500ml and 750ml cans great value for money. We also stock a range of top-class sealants and adhesives – all at amazingly low prices!